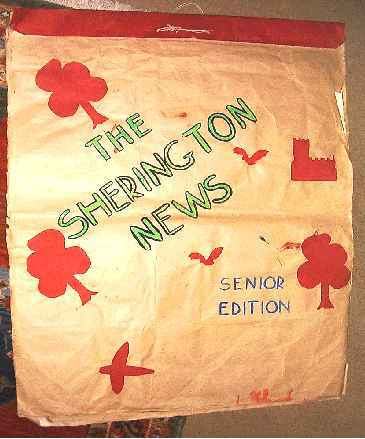 These documents are the transcribed copies of a series of letters written by the pupils of Sherington C.of E. school, in 1957 and 1958. This was done for a school project, a newspaper. The pages written by the pupils were then pasted onto large sheets of brown paper approximately 27” x 33” (70cm x 85cm) and stapled along the top into one volume with a decorated front cover. All the articles are handwritten on separate sheets of paper, of various sizes and colours then in some cases, decorated by the pupils. Most of the pages were unsigned. In total, there were 92 contributions from the pupils. All the spelling and grammar are as written by the pupils. Some alterations have been made, eg. Full names of the pupils as supplied at a later date by the pupils themselves or their friends, or corrections by the teacher, but these have been kept to a minimum, and are always written in italics. Mr. Charles Stephens who was the headmaster at this time, has given this booklet his blessing, & made the following comments. The writings are on odd shaped scraps of paper, it was a time of national shortage & the paper was begged from ‘McCorquadales,’ in Wolverton, as offcuts from their processing, by Mr Stephens, any colour, shape or weight. The brown backing paper, for the newspaper, was from brown paper parcel wrappings, ironed to make flat & useable.